Check out Tobi's Seeking Long Sleeve Mini Dress Time to dial up the ruffles, babe! Get the Finders Keepers' Seeking Long Sleeve Navy Mini Dress, featuring an off shoulder construction, tight long sleeves, ruffled bodice, back zipper, and that classic bodycon fit. Dance the night away in this long sleeve ruffle dress, and pair it with lace up heels. Time to dial up the ruffles, babe! 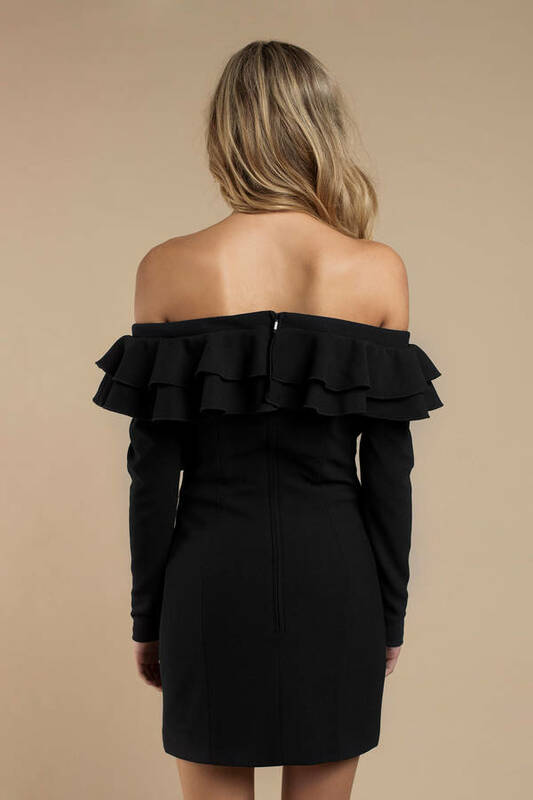 Get the Finders Keepers' Seeking Long Sleeve Navy Mini Dress, featuring an off shoulder construction, tight long sleeves, ruffled bodice, back zipper, and that classic bodycon fit. Dance the night away in this long sleeve ruffle dress, and pair it with lace up heels.